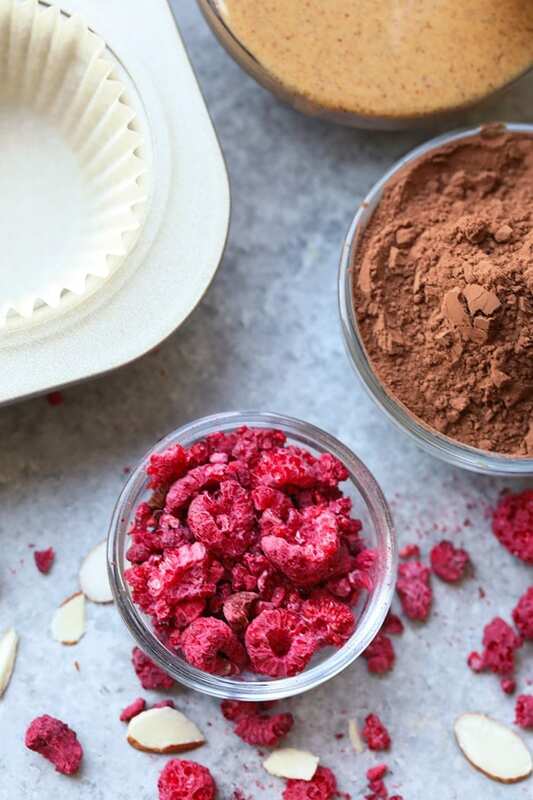 When you have a batch of these amazing Raspberry Chocolate Almond Butter Cups in the freezer, you know life is good. These little cups of heaven are made with all natural almond butter, coconut oil, maple syrup, and freeze-dried raspberries. You might as well make a double batch of these healthy almond butter cups. GUYS. I AM SUPER PUMPED to officially announce that Fit Foodie Finds is hosting their first annual…. I mean, I didn’t think I knew anyone more obsessed with nut butter cups than Linley and me, but you guys have proven us wrong time and time again. Hundreds of you have made our Healthy Peanut Butter Cups and tagged us on Instagram, so we decided to dedicate an entire week to NUT BUTTER CUPS. We thought we’d give a little teaser today to get you pumped for what’s to come. 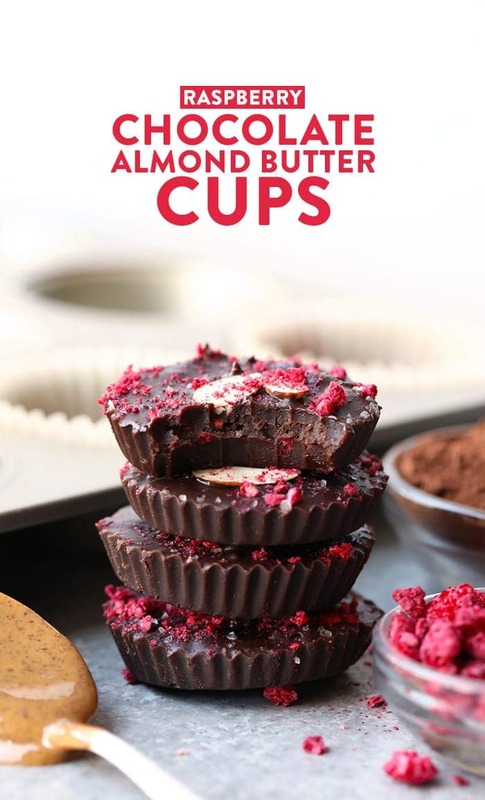 Before we talk about these GAWGEOUS Raspberry Chocolate Almond Butter Cups…let me fill you in on some Nut Butter Cup Week deets. March 11th – March 19th – mark your calendars! Daily giveaways of our fav nut butter cup gear, nut butters, add-ins, etc! Early access + more surprises for Nut Butter Week Subscribers. DO IT HERE. 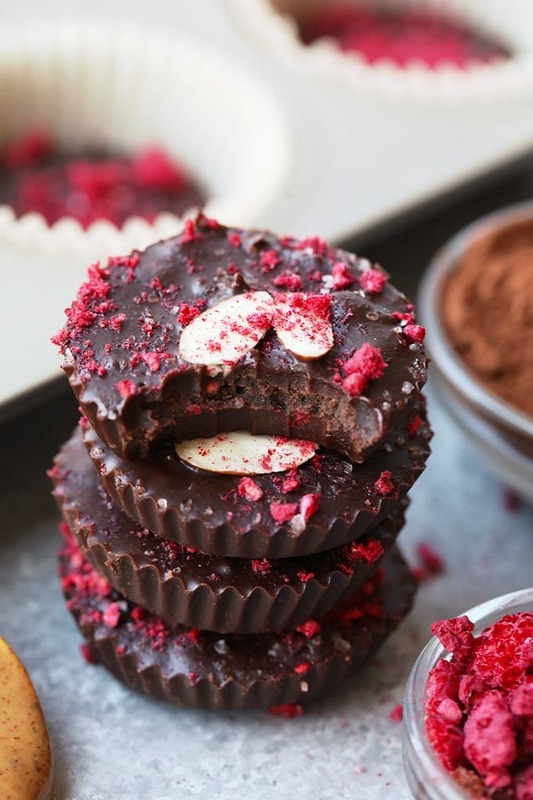 So these raspberry chocolate almond butter cups are pretty much out of this world. We turned to Instagram last week to ask for some interesting flavor combinations and freeze-dried raspberries kept coming up! Obviously, this caught my attention and I immediately went to Trader Joe’s to pick some up. Don’t worry, I found some really great Amazon options HERE, HERE, and HERE in case you don’t live by a Trader Joe’s. 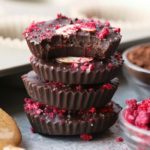 I’ve never actually cooked with freeze-dried raspberries, but they are AMAZING for nut butter cups and 100% made this recipe. So, what do you need? I’d say that all of these items are rather easy to find in all grocery stores, but you can always order online! If you’re wondering what kind of DRIPPY almond butter I like, my suggestions are Kirkland brand from Costco, Trader Joe’s brand, and Fresh Thyme’s brand. I stress drippy because drippy usually means all-natural AKA no additives, which is what I like to look for. The flavor of these babies is so nummy. I’d say that the raspberries aren’t super intesnse, but you can definitely taste them! It’s like a subtle hint of raspberry tang. Since I know you’re going to ask, yes you can sub any other kind of nut butter and/or sticky sweetener in place of maple syrup. Enjoy! First, line a muffin tin with nonstick muffin liners. Set aside. Next, place all-natural almond butter, melted coconut oil, maple syrup, and vanilla extract in a medium-sized bowl. Mix until combined. 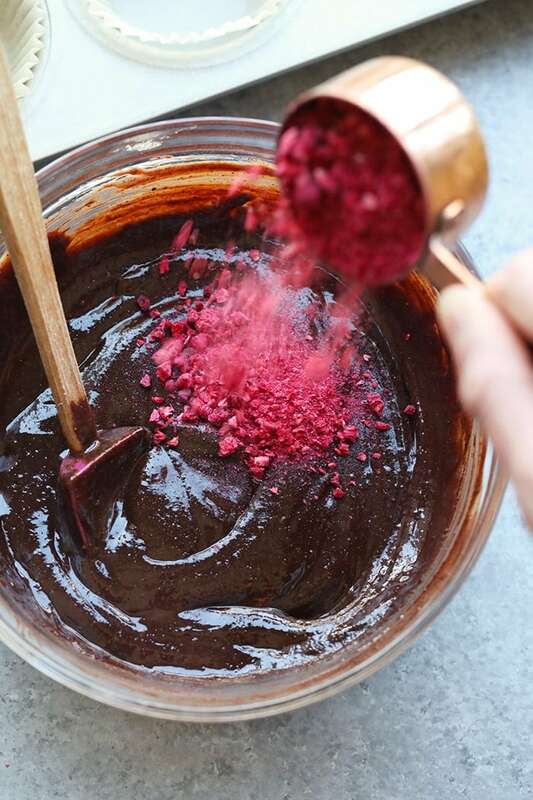 Add cocoa powder and crushed freeze-dried raspberries and mix again until combined. Using a tablespoon, scoop batter into muffin tin. You should get 12 almond butter cups. Top with slivered almonds, more crushed freeze-dried raspberries, and a sprinkle of sea salt. Place muffin tin in freezer and freeze for at least 30 minutes before serving. Enjoy! Store in the freezer an air-tight container or gallon-size bag. Lasts up to 2 months. 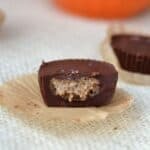 Check out some of our other nut butter cup recipes on FFF and don’t forget to sign up for Nut Butter Cup Week emails HERE!